TRADING HOURS - Mon. Wed. Thu. Fri. Sat. - OPEN 10 AM - 5 PM | CLOSED - Tue. Sun. Receive 1 stamp for every $10* you spend in a single day. Accumulate 20 stamps and receive a $25 store credit which can be issued as a Credit Voucher or an instant deduction off your purchase. Grab a card in-store and start collecting today! - Stamps are issued based on $10.00 increments. - Multiple purchases within the same day can be combined to receive maximum number of stamps. - No retrospective stamps will be issued. - Purchase Receipts will be marked as 'stamped' once sighted and card stamped. 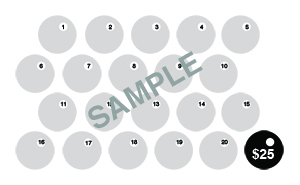 - Stamps are not issued during SALE events and/or selected promotional events. - Stamps are not issued for fees related to Classes/Workshops/Parties, Repairs, Ready-to-Wear and Custom-Made Jewellery/Accessories and Drey Living product purchases. - Stamps are not issued for Gift Card purchases. - Lost Credit Vouchers cannot be replaced or re-issued. 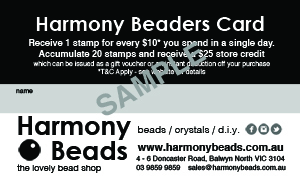 - Accumulated stamps cannot be replaced or re-issued if the Harmony Beaders Card is lost.